Promoting the program to the families - so we can reach the kids who need the food - is one of the most important parts of the program. If we can't reach the families, then we can't provide them with food support. We've compiled some resources and ideas that we hope will aid in this process. Download on the Document Downloads page, available in various languages. Feel free to use your own opt-in format. Enter the information of the person the families should contact at the school to sign up. Ask the organization that sponsors your school if they could provide volunteers to walk around with permission slips, offering to sign people up right there on the spot. Be sure there is information on the school’s website about the program including easy steps for the families to sign up. On the front desk at the school office (have permission slips on hand at the front desk for families to sign up right there). Make sure the front desk staff knows the basics about the program. Have the Principal/Assistant Principal inform the staff - have staff recommend families that they know may be interested in participating in the program. Ensure your Social Workers are aware of this opportunity and offer it to families with whom they connect. Many schools have shared that this program is a great way to open a conversation with families. Ensure your teacher are aware of this opportunity. They can even have permission slips on-hand at parent-teacher conferences and offer to sign families up right there on the spot. 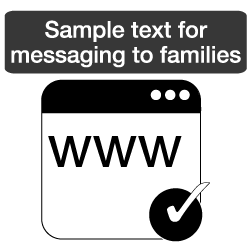 Text you can copy and paste to use on your website, email blast, letter to families, etc. See below for a text option ready for your use! Feel free to change it to fit your needs. Text in italics are place holders for you to enter your own information. We know that some of our families are facing some tough times, so we want to ensure our students have the nutrition they need on the weekends so they can come to school prepared to learn! We are happy to provide this support to our students and their families, and we will distribute the bags of food as discreetly as possible to your child.